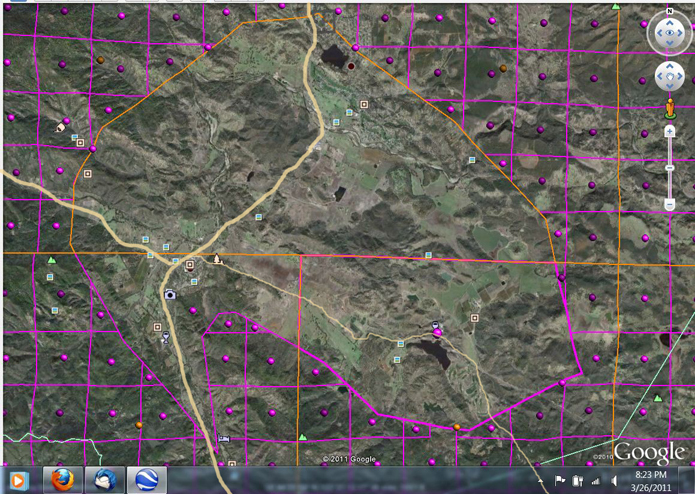 added the Earth Grids module (as do all of the California ranchos). Middletown is at the junction of the two highways seen here, Highway 29 north-south and Highway 175 coming in from the west, continuing east as Butts Canyon Road. Hidden Valley Lake, and Stone House, are located in the uppermost center. Detert Lake is in the lower area somewhat right of center. The dividing line between the two ranchos runs along the peaks of the chain of low mountains just above Hwy. 175 and Butts Canyon Road, dropping directly south just left of Detert Lake.